The W-Poli Win seal is injected with polyurethane with posterior impregnability with molybdenum disulphide. It is a dry lubricant that offers an excellent resistance to abrasion and good compatibility with used fluids in hydraulic circuits. It is not recommended in application with ethers, ketone, waterglycol, brake fluids and aromatics compounds. It contains stability in mid temperature water. It is prepared to work with temperatures that oscillates from 50ºC to 90ºC in continuous services and to 120ºC in intermittent way. Poli Win is a lip seal type, activated with and O’ring which works as spring, that not suffer any kind of slow waste because it has not any contact with friction surface. The O’ring function is provide resistance to the compression set, compensating automatically the slow waste of the seal. When there is not pressure it avoids leaks of fluid. The O’ring resistance makes seal adaptation in oval cylinders slow wasted, acquire better performance respecting to common seals. The working pressure is 400 kg/cm2, depending on the gap between the cylinder and the piston. 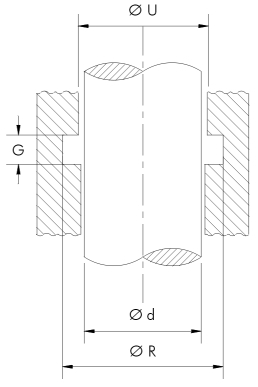 Two nominal sections (S) have to be rested to the cylinder diameter (A), to get the seal group diameter (B) in the piston. 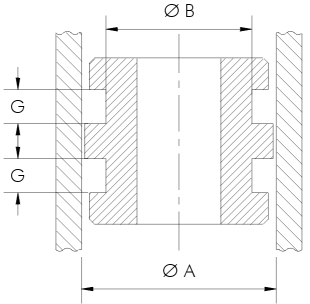 To obtain the outside piston diameter, contemplate the set between piston and cylinder, which both will vary to each used sections according to working , static or dynamic conditions. The groove height (G and G) must be at least 10% superior to seal height (H). Choose the greatest nominal section disposed within the possibilities from the design to obtain widest tolerance admissible diametrical set. The Poli Win can stay stretched up to 5% in working conditions. We recommend the usage of groove which is open on one side for the greatest sections, because it does not require a previous stretch of the seal. Two nominal sections (S) have to be added to the rod diameter (L), to get the greatest groove diameter (D). It must be consider the set between rod and its guide, so it must be added the admissible diametrical set (T), which will vary according to the seal section, to the rod diameter. This calculation and the slipping of the rod will determinate the guide diameter (U). The admissible diametrical set is identified in the picture and the chart.